Once upon a time the great saint Narada went to Prayaga to bathe at the holy confluence. On the way he saw that a deer was lying in the forest and that it was pierced by an arrow. It had broken legs and was twisting due to much pain. Farther ahead, Narada Muni saw a boar pierced by an arrow. Its legs were also broken, and it was twisting in pain. When he went farther, he saw a rabbit suffering similarly. Narada Muni was greatly pained at heart to see living entities suffer so. When Narada Muni advanced farther, he saw a hunter behind a tree. This hunter was holding arrows, and he was ready to kill more animals. The hunter’s body was blackish. He had reddish eyes, and he appeared fierce. It was as if the superintendent of death, Yamaraja, was standing there with bows and arrows in his hands. When Narada Muni left the forest path and went to the hunter, all the animals immediately saw him and fled. When all the animals fled, the hunter wanted to chastise Narada with abusive language, but due to Narada’s presence, he could not utter anything abusive. "As often as Herman had witnessed the slaughter of animals and fish, he always had the same thought:in their behaviour toward creatures, all men were Nazis"
When a human kills an animal for food, he is neglecting his own hunger for justice. Man prays for mercy, but is unwilling to extend it to others. Why should man then expect mercy from God? It's unfair to expect something that you are not willing to give. Being thus assured by the great sage Narada Muni, the hunter broke his bow, immediately fell down at the saint’s lotus feet and fully surrendered. After this, Narada Muni raised him with his hand and gave him instructions for spiritual advancement. The three animals that were half-killed were then brought to their consciousness by the sage Narada. Indeed, the animals got up and swiftly fled. When the hunter saw the half-killed animals flee, he was certainly struck with wonder. He then offered his respectful obeisances to the sage Narada and returned home. After all this, Narada Muni went to his destination. The news that the hunter had become a Vaisnava spread all over the village. Indeed, all the villagers brought alms and presented them to the Vaisnava who was formerly a hunter. In one day enough food was brought for ten or twenty people, but the hunter and his wife would accept only as much as they could eat. One day, while speaking to his friend Parvata Muni, Narada Muni requested him to go with him to see his disciple the hunter. When the saintly sages came to the hunter’s place, the hunter could see them coming from a distance. With great alacrity the hunter began to run toward his spiritual master, but he could not fall down and offer obeisances because ants were running hither and thither around his feet. Seeing the ants, the hunter whisked them away with a piece of cloth. After thus clearing the ants from the ground, he fell down flat to offer his obeisances. Vedic society was a strictly vegetarian society because a vegetarian diet is conducive to higher spiritual realization. Meat eating is one of the greatest obstacles on the path of spiritual progress. Despite farfetched interpretations, no scripture in the world recommends meat eating—although some scriptures may make a concession for individuals who are unable to control their tongue. In the Vedic system, animal sacrifices are classified into two categories. First category is for testing the efficacy of mantras chanted in a fire sacrifice. Under this system, an old animal is sacrificed and by the power of mantras, it is revived back into a young, healthy animal in a process which is completely painless. This rejuvenation, if carried out successfully, determines the accuracy of the chants and successful completion of the fire sacrifice. Vedas prohibit such animal sacrifices in modern times as it is not possible to revive dead animals anymore due to a lack of qualified priests. The second type of animal sacrifice is a concession for compulsive meat eaters. Lower social classes are enjoined to kill a goat in front of goddess Kali on a dark moon night while chanting mantras which explain the sinful reactions of animal killing. The whole purpose is to contain unrestricted meat eating which is so much prevalent in today’s slaughterhouse culture. Also by such regulation, a meat eater can be brought back to his senses gradually. He can realize the futility of accruing bad karma just for the sake of some meat. This licensing of animal sacrifice by Vedas is like licensing of liquor by the government. The purpose is not to encourage but to regulate and thereby restrict. Vedic literatures are replete with stories of Kings who were hunting animals regularly. Again the purpose of such hunting was two fold. First was to contain the menace of violent animals. This allowed the sages to meditate and live peacefully in the forest. They lived there to research, write and pray for the benefit of all living beings. Secondly, it honed the fighting skills of the ruling class. This enabled them to protect innocent citizens from enemies and antisocial elements. When there was too much animal killing, the incarnation of Lord Buddha was there to stop animal killing. In Buddhism there is no animal killing. Although they are now killing animals, but originally Buddha religion means non-violence. Also Lord Christ also said, "Thou shalt not kill." And Krsna says, ahimsa. So in no religion unnecessary killing of animals is allowed. Even in Mohammedans, they are also... Kurvani. Kurvani means they can kill animals in the Mosque. So everywhere animal killing is restricted. Thus it is out of compassion that the Lord appears in His different forms. Lord Sri Krsna appeared on this planet out of compassion for fallen souls; Lord Buddha appeared out of compassion for the poor animals who were being killed by the demons; Lord Nrsimhadeva appeared out of compassion for Prahlada Maharaja. The conclusion is that the Lord is so compassionate upon the fallen souls within this material world that He comes Himself or sends His devotees and His servants to fulfill His desire to have all the fallen souls come back home, back to Godhead. Another common objection to vegetarianism is, "Jesus Christ ate meat, so why shouldn't we?" But vegetarian Christians point out that the ancient Greek, from which the New Testament was translated, does not support the contention that Christ ate meat. For example, Greek words like brosimos, prosphagion, and trophe, all of which mean simply "food, or "nourishment," were loosely translated as "meat” (except in the New English Bible). And, vegetarian Christians assert, where the Bible states that Christ was offered fish and a honeycomb and accepted ‘it’ (singular), it means the honeycomb. In the Old Testament a verse predicts this of the youthful Christ: "He shall eat butter and honey, that he may know to refuse the evil and to choose the good." (Isaiah 7:15) The purport would seem to be that to behave otherwise would lead to a brutish mentality, which cannot be accepted in the character of Christ. In many more places the word ‘meat’ has been wrongly inserted. For example, in John (4.8) it states: "For his disciples were gone away unto the city to buy meat." The word meat was taken from the Greek word trophe, which actually means nourishment. This is exactly the same case in Acts (9.19): "And when he had received meat, he was strengthened." When translated accurately it means that by receiving nourishment, he felt stronger. In Luke (8.55) we find, "And her spirit came again and she arose straightaway: and he (Jesus) commanded to give her meat." The word meat in this case was translated from the Greek word phago, which translated correctly simply means to eat. In I Corinthians (8.8) it states: "But meat commendeth us not to God, for neither, if we eat, are we the better; neither if we eat not, are we the worse." The word for meat here is broma, which actually means food. Therefore, this verse signifies that eating or not eating food has little to do with our relationship to God and not, as some people think, that eating meat holds no wrong. In Romans (14.20-21) the verses are: "For meat destroy not the word of God. All things indeed are pure; but it is evil for that man who eateth with offence. It is good neither to eat flesh, nor to drink wine, nor anything whereby thy brother stumbleth, or is offended, or is made weak." The word for meat here is broma, which actually means foods, and the word for flesh is kreas, which does mean flesh. Therefore, this verse makes it clear that flesh eating is unacceptable. If the Bible explains that eating meat is wrong, then what is the proper thing to eat? Genesis (1.29) clearly states: "And God said, Behold, I have given you every herb bearing seed, which is on the face of all the earth, and every tree, in which is the fruit of a tree yielding seed; to you it shall be for meat." This makes it quite obvious that the food for human beings is herbs, seeds, grains, and fruits. We also find in Isaiah (7.14-15): "Therefore the Lord Himself shall give you a sign; Behold, a young woman shall conceive, and bear a son, and shall call his name Immanuel. Butter and honey shall he eat, that he may know to refuse the evil, and choose the good." The first verse is often quoted by Christians for proof that Jesus was the savior, but the next verse shows that he will be a vegetarian to know the difference between right and wrong. “Lord Christ says ‘Thou shalt not kill’; why you are killing?” They give evidence that “Christ also ate meat sometimes.” Sometimes Christ ate meat, that’s all right, but did Christ say that “You maintain big, big slaughterhouse and go on eating meat?” There is no common sense even. Christ might have eaten. Sometimes he... If there was no, nothing available for eating, what could you do? That is another question. In great necessity, when there is no other food except taking meat... That time is coming. In this age, Kali-yuga, gradually food grains will be reduced. It is stated in the Srimad-Bhagavatam, Twelfth Canto. No rice, no wheat, no milk, no sugar will be available. One has to eat meat. This will be the condition. And maybe to eat the human flesh also. This sinful life is degrading so much so that they will become more and more sinful. 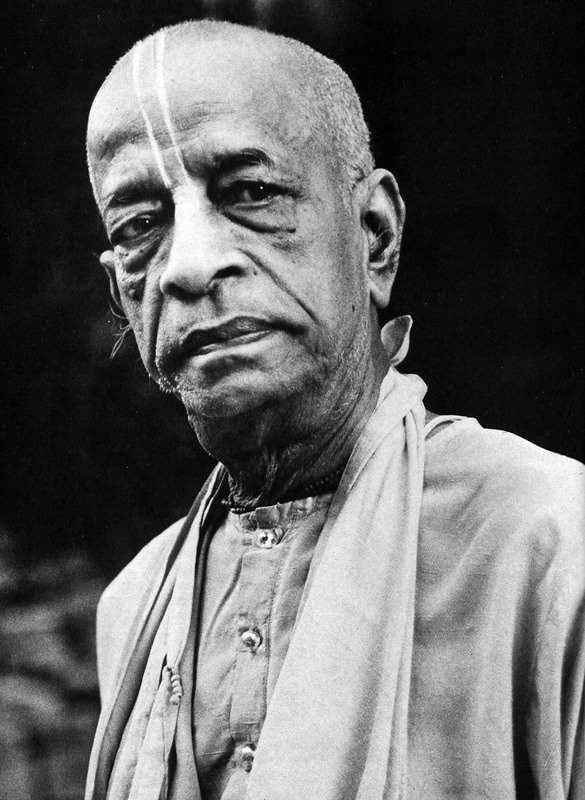 Srila Prabhupada: But the Bible does not simply say, "Do not kill the human being." It says broadly, "Thou shall not kill." Srila Prabhupada: No. Human beings are meant to eat vegetarian food. The tiger does not come to eat your fruits. His prescribed food is animal flesh. But man's food is vegetables, fruits, grains, and milk products. So how can you say that animal killing is not a sin? Srila Prabhupada: So if the cow is your mother, how can you support killing her? You take the milk from her, and when she's old and cannot give you milk, you cut her throat. Is that a very humane proposal? In India those who are meat eaters are advised to kill some lower animals like goats, pigs, or even buffalo. But cow killing is the greatest sin. In preaching Krishna consciousness we ask people not to eat any kind of meat, and my disciples strictly follow this principle. But if, under certain circumstances, others are obliged to eat meat, then they should eat the flesh of some lower animal. Don't kill cows. It is the greatest sin. And as long as a man is sinful, he cannot understand God. The human being's main business is to understand God and to love Him. But if you remain sinful, you will never be able to understand God --what to speak of loving Him. Srila Prabhupada: So, in the Bible God's practical commandment is that you cannot kill; therefore killing cows is a sin for you. Srila Prabhupada: No, no. Jesus Christ taught, "Thou shall not kill." Why do you interpret this to suit your own convenience? 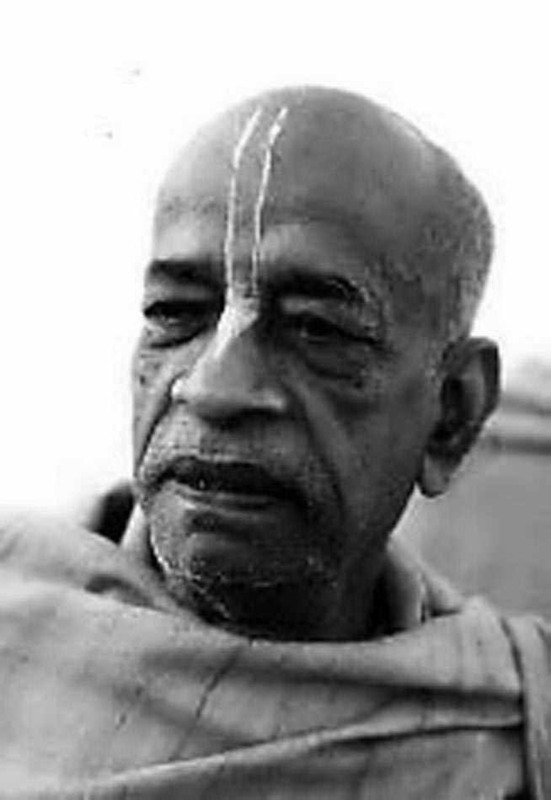 Srila Prabhupada: But he never maintained a slaughterhouse. Cardinal Danielou: (laughs) No, but he did eat meat. Srila Prabhupada: When there is no other food, someone may eat meat in order to keep from starving. That is another thing. But it is most sinful to regularly maintain slaughterhouses just to satisfy your tongue. Actually, you will not even have a human society until this cruel practice of maintaining slaughterhouses is stopped. And although animal killing may sometimes be necessary for survival, at least the mother animal, the cow, should not be killed. That is simply human decency. In the Krsna consciousness movement our practice is that we don't allow the killing of any animals. Krsna says, patram puspam phalam toyam yo me bhaktya prayacchati: "Vegetables, fruits, milk, and grains should be offered to Me in devotion" [Bhagavadgita 9.16]. We take only the remnants of Krsna's food (prasada). The trees offer us many varieties of fruits, but the trees are not killed. Of course, one living entity is food for another living entity, but that does not mean you can kill your mother for food. Cows are innocent; they give us milk. You take their milk -- and then kill them in the slaughterhouse. This is sinful. Student: Srila Prabhupada, Christianity's sanction of meat eating is based on the view that lower species of life do not have a soul like the human being's. 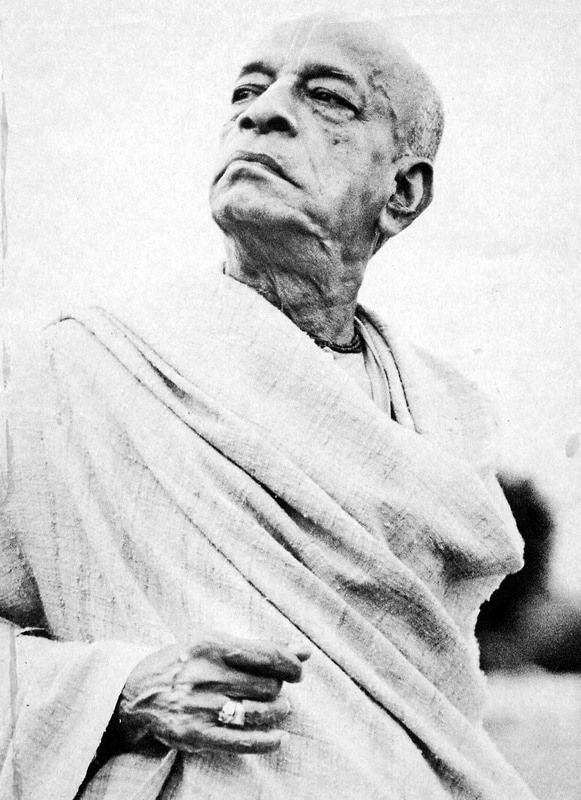 Srila Prabhupada: That is foolishness. First of all, we have to understand the evidence of the soul's presence within the body. Then we can see whether the human being has a soul and the cow does not. What are the different characteristics of the cow and the man? If we find a difference in characteristics, then we can say that in the animal there is no soul. But if we see that the animal and the human being have the same characteristics, then how can you say that the animal has no soul? The general symptoms are that the animal eats, you eat; the animal sleeps, you sleep; the animal mates, you mate; the animal defends, and you defend. Where is the difference? Srila Prabhupada: Our Bhagavad-gita says sarva-yonisu, "In all species of life the soul exists." The body is like a suit of clothes. You have black clothes; I am dressed in saffron clothes. But within the dress you are a human being, and I am also a human being. Similarly, the bodies of the different species are just like different types of dress. There are 8,400,000 species, or dresses, but within each one is a spirit soul, a part and parcel of God. Suppose a man has two sons, not equally meritorious. One may be a Supreme Court judge and the other may be a common laborer, but the father claims both as his sons. He does not make the distinction that the son who is a judge is very important, and the worker son is not important. And if the judge son says, "My dear father, your other son is useless; let me cut him up and eat him," will the father allow this? Srila Prabhupada: That difference is due to the development of consciousness. In the human body there is developed consciousness. Even a tree has a soul, but a tree's consciousness is not very developed. If you cut a tree it does not resist. Actually, it does resist, but only to a very small degree. There is a scientist named Jagadish Chandra Bose who has made a machine which shows that trees and plants are able to feel pain when they are cut. And we can see directly that when someone comes to kill an animal, it resists, it cries, it makes a horrible sound. 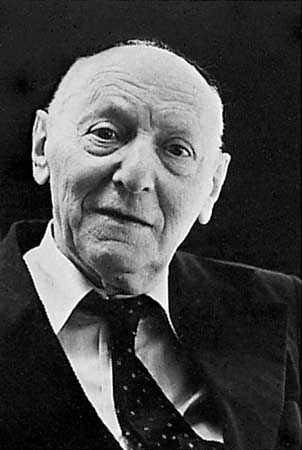 So it is a matter of the development of consciousness. But the soul is there within all living beings. 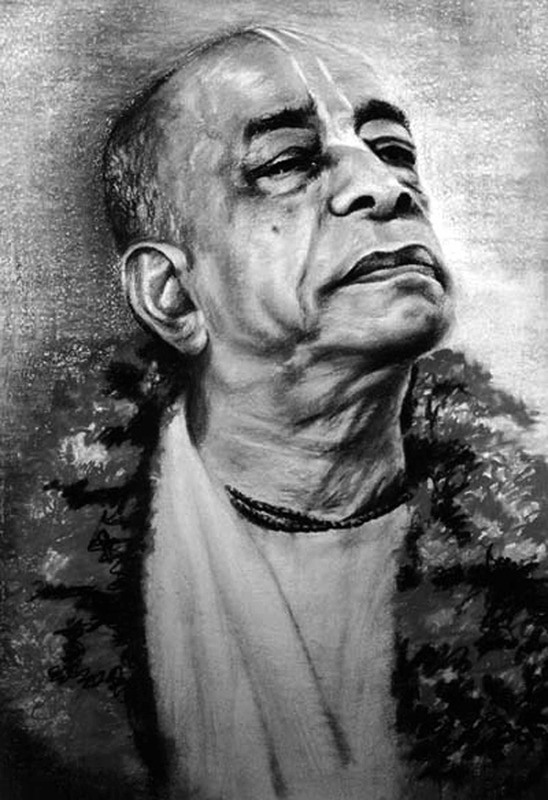 Srila Prabhupada: What is that higher platform? The animal eats to maintain his body, and you also eat in order to maintain your body. The cow eats grass in the field, and the human being eats meat from a huge slaughterhouse full of modern machines. But just because you have big machines and a ghastly scene, while the animal simply eats grass, this does not mean that you are so advanced that only within your body is there a soul, and that there is not a soul within the body of the animal. That is illogical. We can see that the basic characteristics are the same in the animal and the human being. Srila Prabhupada: Yes. So metaphysically search out why you believe that there is no soul within the animal -- that is metaphysics. If you are thinking metaphysically, that's all right. But if you are thinking like an animal, then what is the use of your metaphysical study? "Metaphysical" means "above the physical" or, in other words, "spiritual." In the Bhagavad-gita Krsna says, sarva-yonisu kaunteya: "In every living being there is a spirit soul." That is metaphysical understanding. Now either you accept Krsna's teachings as metaphysical, or you'll have to take a third-class fool's opinion as metaphysical. Which do you accept? Srila Prabhupada: It is not a fault. God is very kind. If you want to eat animals, then He'll give you full facility. God will give you the body of a tiger in your next life so that you can eat flesh very freely. "Why are you maintaining slaughterhouses? I'll give you fangs and claws. Now eat." So the meat eaters are awaiting such punishment. The animal eaters become tigers, wolves, cats, and dogs in their next life -- to get more facility. So this is nature's law. You don't require to be sent to the slaughterhouse. You'll make your slaughterhouse at home. You'll kill your own child. Abortion. This is nature's law. ....If you kill, you must be killed. Bhagavan: They kill the cow, which is a mother, and then sometimes they get, when their mother kills them. One of the strongest objections animal killers raise against vegetarianism is that vegetarians still have to kill plants, and that this is also violence. But there is no logic in equating fully sentient animals like cows with lowly vegetables. Certainly, plants are as alive as cows; modern experiments prove that plants have feelings, and the Bhagavadgita, the essence of all Vedic teachings, confirms that all life forms contain spirit souls qualitatively equal to one another. Formerly if somebody is attacked by another man, many persons will come to help him: "Why this man is attacked?" But at the present moment if one man is attacked, the passersby will not care for it because they have lost their sympathy or mercifulness for others. Our neighbor may starve, but we don't care for it. But formerly the sympathy for other living entities, even for an ant... Just like Maharaja Pariksit, while he was touring on his kingdom, he saw that one man was trying to kill a cow. Pariksit Maharaja saw. Immediately he took his sword that "Who are you? You are killing a cow in my kingdom?" Because the king is supposed, or the government is supposed to give everyone protection, not that the government is meant for giving protection to the human being and not to the animals. Because it is Kali-yuga, the government discriminates between two nationals. National means one who has taken birth in the land. That is called national. That is... You know, everyone. So the trees, they are also born in the land, the aquatics also born in the land. The flies, the reptiles, the snakes, the birds, the beasts, human beings -- everyone is born in that land. Suppose your land, America, United States... Why the government should give protection to one class of living entities, rejecting others? This means they have lost their sympathy for others.